Having correct processing steps information can be important for the functioning of automatic workflows. As such, pdfToolbox implements a number of specific processing steps checks. This condition returns true if processing information is present in the document, false if it is not. This condition can be used to find out whether the same processing steps information is used for more than one layer. 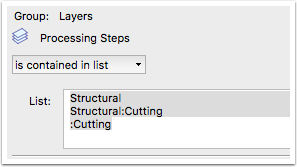 If two layers are marked "Structural" > "Cutting" for example, it makes it harder to figure out which of those two is the actual die-line, and it might indicate other problems with the file or the workflow. The line contains just the name of a processing steps group, no type is mentioned. This will create a hit for any processing steps layer that has this specific group (regardless of type). The line contains the name of a processing steps group, followed by a colon (':'), followed by the name of a processing steps type. This creates a hit for any layer that has the specified group and type. The line contains a colon (':'), followed by the name of a processing steps type. This creates a hit for any layer that has the specified type (regardless of group). The processing steps standard defines a list of predefined groups and types, but it also allows custom values to be used when none of the predefined values can be used. This condition finds layers where such custom values are used.